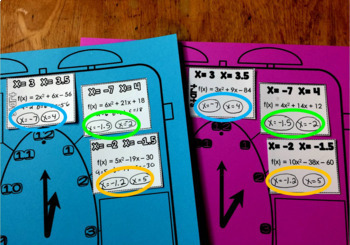 Students work in partners to solve quadratic functions with the Quadratic Formula in this collaborative "Around the Clock" algebra activity. 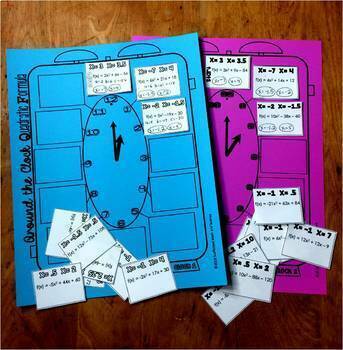 Each partner gets a clock with 12 unique quadratic functions to solve and an answer sheet. Some functions can be factored, but most cannot. Each partner's clock problems are different but the answers are the same, encouraging collaboration and teamwork. If one student gets stuck, the other can help. If student answers differ, they work together to figure out the correct answer before moving on to the next problem. *All solutions are real in this activity. Students paste their START slip at 12 o'clock, solve its quadratic and find the solutions on the top of another slip. They then paste this next slip at 1 o'clock and solve its quadratic. Each answer students find will lead to the next problem to solve. Students solve all 12 quadratic functions until they get back to 12 o'clock. If all problems have been solved correctly, the solution to the problem at 11 o'clock will be found at the top of their START slip. The activity is self-checking, providing students with instant feedback. The final product is a colorful example of their ability to solve using the Quadratic Formula. 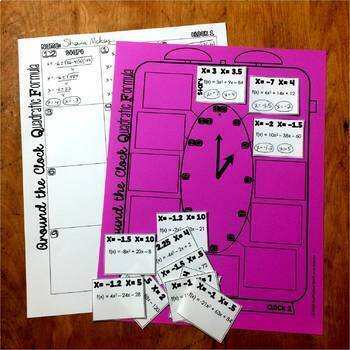 Includes student answer sheets and answer key. 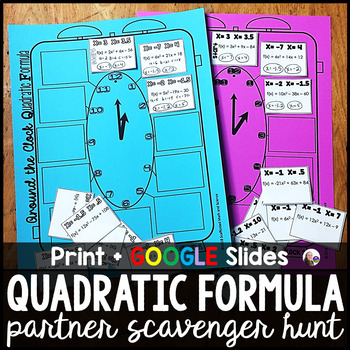 See more Partner Scavenger Hunts here.